Homeowners associations are supposed to help maintain the safety and looks of a neighborhood. All too often, though, they become a power trip for those who are part of the board, and just end up making residents miserable instead. "Homeowners of reddit. What are the most insane HOA rules you have had to deal with?" Below you'll find some of the worst nonsense to come out of the horror that is a homeowners association. We can only have 3 types of flags on a flag pole (that has to be approved) out front. An American flag, a military flag, or a South Carolina flag. One of our neighbors were warned a couple times until they took their cutesy frog flag down. Fly a Texas flag. They'll invade in an armada of lifted trucks if someone tries to take it down. My parents' HOA has a rule that you are NOT allowed to cut down trees without a "permit" from them, at ANY time, for ANY reason. The first winter they lived there, there was an ice storm and a tree fell onto the neighbor's deck, taking out his entire deck and the sliding glass door that went from his kitchen to his deck. My dad went over with his chainsaw to help him cut down the tree that was now in his kitchen, and, MID-STORM, someone from the association heard the chainsaw and came over asking if they had a permit, to cut apart the tree in my neighbor's kitchen. IIRC, he told them to get bent and they tried to give him a 1000 fine for "cutting down a tree without a permit." Essence of HOAs right here. Same people don't care about them, and obsessive lunatics inevitably end up in charge. It's a priss-ocracy of people with control issues. I had an HOA try to enforce that I had much to old of a car to be in the driveway. Mind you, no rust, always clean, never dusty/dirty. Went to court and the judge ordered a full audit of the HOA. It was not enforceable at all, they paid my legal fees and last I knew they have yet to police anything. I used cool white LED Christmas lights instead of warm white, there was no specifics given in the hoa handbook. After that year it was placed in there. TIL: white comes in more shades than white. I was once "warned" about storing my trash in view of the street. I thought to myself, "That's funny, I'm pretty on top of the trash", so I checked the date of the infraction. Sure enough, it was trash day. They were upset at me about putting my trash out on trash day. Well, currently they are trying to go after me for bushes in my front yard saying you cant have a "fence" in your front yard and you must remove the bushes.... Theres a lady with an actual picket fence in her front yard that is allowed to keep it. But my bushes that were planted by the previous owner about 10 years ago or more have to be removed. Oh also they put a lien on some ones house for having a boat in the driveway meanwhile some one on the board has had a pop up camper in their driveway for months, not even a single notice was given. My friends HOA fined him because the flag pole that was already up in his front yard when he purchased the house, was too tall. He countered by flying a pirate flag on that flag pole. They are even less happy with the flag pole now. My Townhome neighborhood has an HOA that covers the exterior of our homes (since they all share the same exterior, being connected and whatnot). My front door has developed a rotting spot on the edge, so I sent a claim in for the HOA to replace it. They said the front door does not fall within their definition of the exterior of the home. That's fine, whatever, I'll just buy a new one. But wait! I have to fill out an EXTERIOR CHANGE REQUEST to get a new front door. The door they said doesn't count as exterior. needs and EXTERIOR change request sent to approve any external changes made. They want to control what my door looks like, but I have to pay for it. I lived in a fairly large 'family friendly' townhouse community. There was a community baseball field, at least it was set up like a baseball field with the fences and backstop, but essentially it was just a giant field, further down was a playground and fenced in tennis court. It was meant to be used there were dozens of kids playing baseball, football, soccer, or whatever on it all the time. For really no reason they decided to shut it down. Overnight they put up signs to not use it and keep out. If your kids dared to even walk across it police would be called in minutes. We were playing tennis on the courts one day and police were called, the next day it was locked up with a chain and combination lock. We called the HOA and were told we would have to give them proof we actually played tennis to be given the combination. My parents and a lot of other parents got in long arguments on the phone and at the HOA meetings about why they made these ridiculous new rules, they were essentially told 'because we can.' It became a war in the community against the old ladies that ran the HOA and the younger families with kids. They had someone go around and check if the dogs are leashed, if not the they call animal control to have them taken away. HOA has called animal control on people who have their dogs leashed, their reason? The length of the leash was either too long or too short. They tried to take away one guy's dogs for that reason and that sparked a war between the HOA head and the homeowner who was a former Marine (I think) and all around madman. HOA head did not stand a chance against a retired crazy person who had a lot of time and money. Crazy guy built a pool and let everyone used it for free, making the $20/month pool the HOA set up useless. Crazy guy also held a giant all inclusive party that had menus for everyone and any police that came to check on it left with to go bags. He also had a Halloween party, as the HOA did not allow trick or treating. Crazy guy was well loved and the head was ousted from the HOA after she tried to break into crazy guy's house. The ban on trick or treating has been there since way before the former head took charge, the neighborhood had only white people living in it until the 90s and it became diverse after that. I guess the ban was put so the people that had it put didn't want to be disturbed, and it was enforced, their reasoning was that it was to protect everyone. Bullsh*t.
Crazy guy was seen as crazy by these HOA cultists because he didn't follow their rules and more often than not he was the most well liked guy in the neighborhood. The former head was the trophy wife of this big shot doctor and her father owned most of the land in the neighborhood. She wasn't crazy, just power tripping and stupid. The crazy guy never ran for HOA, but he did start a restaurant, sponsor a drag competition, and possibly took up karate. I was threatened with an $85 fine because they claimed my tree was shading the sidewalk by 2". It was such an odd complaint. I just wondered what kind of person was involved with that report. Mailbox post has to be a perfect 90 degrees. 1. Had an HOA rant and rave about approved colors. They hounded me saying we cannot deviate from these preselected colors as lots of time, effort and money was put into these groupings of 3-4 colors per set. Fine, whatever... not unheard of. I asked for the approved colors, they handed me a SherwinWilliams "Coastal Colors" brochure. It has like 5 sets of colors and you can literally pick this up anywhere. I heard the approved colors just switch every time one of those new brochures come out. 2. An HOA that does not allow trucks (pickups) but allows lifted SUVs. 3. Not an HOA but a Building Dept reviewer once told me that if a client does paint touch ups in this certain district they can only use approved colors. But... the building was not colored one of the approved colors. They did not budge on this. Meaning they would rather this old building look like absolute crap decaying into nothing than allow us to touch up with similar paint. 4. Had an HOA reject one of our designs because the front balcony was 6" wider than the neighbors balcony. "They must share a similar design and aesthetic style." 5. There once was a man Dane. Who wanted an out door fire pit to entertain. We designed and he loved it, then went in to permit. But alas the HOA doesn't allow a visible flame. 6. Had an HOA not allow fences, just hedges. But according to an overarching municipal code, there MUST be a partition that separates the pool from some main walkways for safety (kids and whatnot). Most people did the removable kind that sticks into the ground with a net since it's stupid cheap. We built a "pool fence" around this guy's entire yard and claimed code compliance. 7. We have signs that we put in front of buildings that are under construction to advertise that it is our design and we incorporate the address in that sign so that the address is still on display per county ordinance (I think). It is one of those simple signs that looks like a realtor sign. HOA (actually more like a neighborhood council, which is a bit more formalized and I believe city or county funded) doesn't allow those simple signs. Owner had to pay for this very lovely looking sign custom fabricated with wrought iron by a local guy to put in front of... a construction zone. 8. OH ONE MORE! Another comment reminded me of this one. I did a small remodel for a guy adding some outdoor space. When we submitted for permit the building department rejected it with two google maps aerial pictures attached; one from 2010 and one from 2017. They noted that many trees that were there before are not out there now and requested that we fill out a tree removal permit. Two hurricanes hit between then and now which knocked down many trees. They had to pay 500$ more for this "permit". The implication of this means that every hurricane almost 600 sq miles of homes theoretically need to pay to remove those trees that were knocked down. I know the other in this list are bad, but this one is complete shenanigans. This one was brand new to me and so I have yet to look into it further. Stuff like this one takes advantage of disaster victims. In practice though it appears this only affect those who want to permit a reno or new construction. I had a friend that lived in a strict HOA neighborhood. He was an architect in the process of remodeling his home, which required a new roof. He submitted different shingle samples for HOA approval, but the HOA kept rejecting them. Finally, the HOA gave him the manufacturer and color name of 4 or 5 "pre approved" shingle styles. There was nothing in the HOA bylaws that sated he could only use one color, so he used all 4 or 5 colors. The HOA was pissed, but couldn't do anything about it. The wheels got stolen off my car, couldn't get it towed that night because no places were open. Next morning I'm coordinating calls between the body shop and my insurance when I look out my window and see my car wasn't there. Some a-hole HOA property manager had my car towed because it was a "danger" to the surrounding cars. Luckily my insurance company covered the towing fees. it was a "danger" to the surrounding cars. Cars without wheels are like rotting fruit. One bad car in the lot, next thing you know the wheels are falling off all the others. My friend and coworker showed me the Facebook page to her HOA. They make daily posts that residents can't park in their driveways because it ruins the aesthetic of the neighborhood. The posts contain threats of tickets and possible towing. She paid $350,000 for a townhouse and can't park in her garage because she drives a truck and it won't fit. When I was growing we lived in a neighborhood with an insane HOA. We had a trampoline with no cover on the springs, so we got a notice saying we needed to buy a cover. No problem, we bought a standard blue cover the next day, no biggie. The following day we got a notice with a $200 fine that our trampoline pad didn't match the trim on our house and we, therefore, had two days to remove and replace it. We also regularly got complaints for playing in the street (of a very suburban neighborhood with almost zero traffic, we were ages 10-15), received a fine for our basketball hoop's net being too tattered (it wasn't), and countless others. My mom made it her mission to troll the HOA as much as possible. Eventually the old neighbors across the street both died and the complaints/notices instantly stopped coming. 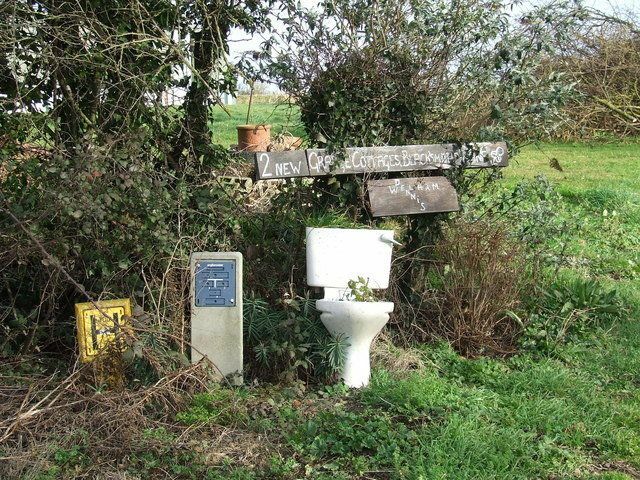 I got a notice that said "Owner will remove toilet from yard"
The HOA guy must have driven by during the 10 minute window where the plumber had my old toilet sitting in the yard before he cleaned up and left. I guess the plumbing truck and toolbox wasn't enough for the HOA guy to put two and two together - he saw that toilet and immediately thought it was a permanent fixture in my front yard. Our Condo HOA sent a notice that we are not allowed to have our cat on our own patio, on a harness, under our own supervision. Someone complained he had eaten the grass that lines the patio. Got some nastygrams because my grass was too tall. I hadn't cut it in two weeks due to being gone on a trip and poor weather. Okay, not a big deal, so I cut my grass. A week later get dinged for having grass that was too tall. Now I'm confused, how much shorter do you want my grass. Contacted the HOA and asked what was going on and they said my grass was over two feet tall. There is green space beside my property that belongs to the HOA that they had neglected to cut since I moved in. Turns out it was their own problem in the first place. My parents house when I was fairly little (they owned it from when I was 4 to about 13) was HOA. They eventually wanted to paint the house because it'd been built in the 1950s and probably hadn't been painted since then. They'd originally wanted to paint it a very reasonable shade of blue or red for a house-not an eyesore by any means. HOA refused to approve it. Instead my parents got to use the most horrendous shade of green known to man. That color was an abomination. The day after our wedding, we returned home with a car full of gifts, wife's dress, etc. and because we had been so busy saying good bye to guests at the hotel, never had a chance to eat all day. So we parked out car in the circle outside the lobby and decided to eat sandwiches we'd picked up on the way home at a round table in the lobby before unloading the car. Some old biddy from the board comes up to us in a huff, "You're NOT ALLOWED to eat at this table!" Verified with the doorman, who concurred that was the HOA policy. Growing up I lived in a gated community with a swimming pool and one of the pool rules was that house help were not allowed to swim in it. When I was a kid I didn't really care but now looking back it was a totally senseless and elitist rule. Why shouldn't the help use the swimming pool if they aren't even causing a scene or harming anyone or breaking any of the other (sensible) pool rules? Edit: Sorry I forgot to mention I live in the Philippines which is a pretty homogeneous society so no this isn't racism. This is just a matter of rich people alienating the other half. Not me but my parents. They moved into a new subdivision with 2 dogs. Less that 2 months after they moved in they had a fence built in the back yard. 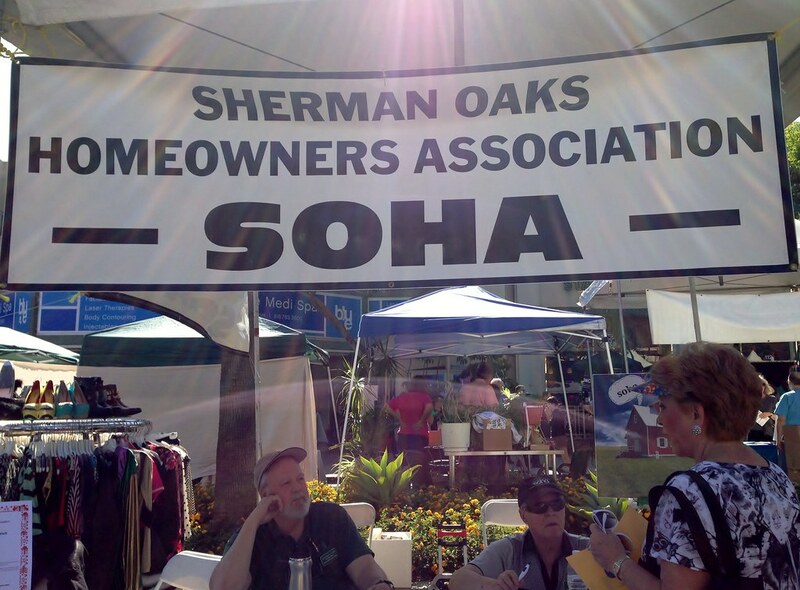 Around 5 months after they moved in a HOA was formed. The HOA attempted to fine my parents for building a fence without getting a permit from the HOA. They fought the fine and eventually didn't have to pay it. but it took 2 months of fighting them until the HOA understood that the fence was built BEFORE the HOA was even formed. My parents live in a neighborhood with strict HOA rules. However, they are one of two houses in the entire subdivision that are NOT under the HOA! But the people across the road from them are, and they're also the worst kind of neighbors. My parents have an old SUV, like a 2000 Expedition, because they needed something to haul their five teenagers around in. Still runs just fine but kinda ugly. They park it on the street in front of their house most days. Neighbors across the road have called the HOA, the city councilman, the police even, because HOA says you're not allowed to park on the street for more than 2 hours at a time. The HOA (via the d*ck neighbors) even tried to get the city to tow the truck as abandoned when my parents went on vacation for a long weekend-- thankfully I was house sitting for them (read: mooching off their food and awesome cable package) and prevented that. The HOA can't do a damn thing about it, because my parents aren't in the HOA. My mom's next act of rebellion is going to be to paint their front door dark purple, because it's not an "approved" color on the HOA list. Also, she's keeping her Vote for Beto sign in the front yard forever because signs are banned by the HOA (and also the d*ck neighbors across the road have a Cruz sticker on their car). My husband and I had a cute yellow shelf on our condo's patio. We received a letter saying it wasn't allowed. We wrote back and asked them what rule it was violating (because we had read them all). They sent us back a copy of the rules with random bits highlighted, such as the "beige or other neural colors" that was actually in reference to window coverings, and "no other colors allowed" in reference to pots only being allowed in terra cotta. We eventually took it inside, but I've been gradually replacing some of our potted plants with non-terra cotta pots. Take that, HOA. Letter from HOA placed (illegally w no postage) in our US Mail box saying our mail box was too weathered and must be repainted. Two days later another illegal brochure in our mailbox with "independent business" offering to repaint our mailbox. Wonder how many of those approved "independent businesses" were owned by HOA board members or friends/relatives of those members?? We cannot park on the street for more than 3 days a month. So too bad for you if you are trying to do any project in the garage. We cannot mow our own grass, we have to use their useless lawn service. They send us pictures and letters about our fence in the backyard that you can only see from our backyard. We live against a greenbelt so the mandatory plastic white fences get dirty quick. The streetlight outside out house was knocked down 2 years ago and still had not been replaced. The small crack in the sidewalk outside an HOA council members house wan repaired. We pay $2000 a year for horrible lawn service and a very small park with 1 tree and 2 tables in it. I own the house that my parents gave me. lived there for over 15 years now. Same mail box the whole time. One day, out of the blue, I was told mail box is not HOA compliant. I told them to go fix it themselves because I'm not shelling out money for something I didn't do. I was told it would cost $50 to move the box from the side of the post to front of the post. I flatly said no and they "fixed" it for free. My HOA didn't like the color of the lights inside my condo. They threatened to take me to court claiming that I altered the exterior appearance of the building. I spoke to their lawyer at an event and he said that it wouldn't hold up in court, so he wouldn't let them try to pursue it. They're Philips hue lights, at the time they were blue. My mom and dad live in a development with an HOA, although hardly anything is ever enforced. What has been enforced is anything that the clique running the HOA don't like what their deaf neighbor does. They got him over setting up his trains on a table in his own garage because, according to the HOA, any surface bearing items greater than something like 20lbs has to be built with the ability to hold a grown adult standing on top. I don't remember the exact wording, but they actually made him dismantle his train tables. And the only reason they knew he had them is because they were peeping into his garage. I received a letter saying i was going to be fined $50 a day because my grass was dead. It came the day after I closed. We had 5 of us renting a 5 bedroom house. This house had 4 parking spots, 2 in the garage and 2 in the driveway. We were not allowed to park on the street without a permit overnight. Well, 5 guys, 5 cars, 4 spots. Math. We ordered a parking permit, but were denied due to "not being a family". When we called to ask what that means, HOA stated that we all needed the same last name. This of course is after we called in and asked what we needed to do to get one, which was; 1. have all cars registered to the house (paid for that), 2. pay the "application fee". We ended up parking the 5th car sideways behind the other cars, every single night. The HOA was only able to tow from the street, and therefore, "warned" us each night, for the entire year there, that it was a "problem". We bought a house from an owner who was not within guidelines on multiple items (we also weren't informed of this until we moved in). The main two issues were dead grass and the outdoor light was taken out. Some old cranky b*itch called the HOA on us within the first week we moved in. We bought a solar light to put in, not a big deal. Nope - after it was approved by the HOA, they said it needs to be hard-wired in. We had someone come out and tell us where the light should go but HE WAS WRONG - because that indent in our lawn was where a bush was, not the light. While the HOA guy was telling us where the light should go, he mentioned that the previous owner replaced the fence and it's not the right color of cedar.... The cedar wood... isn't the right shade of cedar. I work on an island in Florida that is a tourist destination. The local HOA president comes into my store every week to complain if our dumpster gate is open and you can see the bin. She has threatened a lean on the business, and said that she will be in contact with the owner. Problem is, HOA only gas authority over residential, and our building is classified as commercial. Sometimes we "forget" to close the gate on trash days, and then direct her towards the company ware house when she has complaints, because it's off the island, about an hour away. Petty?. Yes. Worth it?. Also yes. 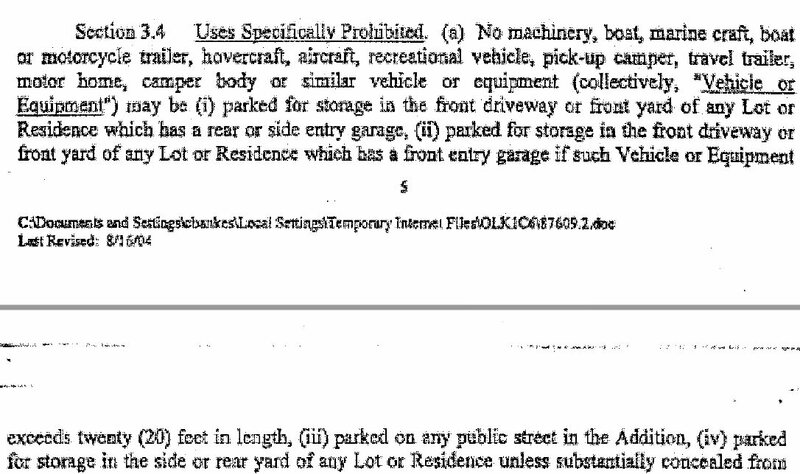 Our HOA agreement prohibits us from parking a hovercraft in front of the house. It's really not too crazy. We got a copy of the agreement and pored over it before we made an offer, and attend all meetings to ensure the board isn't going mad with power. When we started looking for a house, we originally hadn't intended to purchase one in an HOA, but it turned out that if we wanted to buy one we could afford within a reasonable driving distance of work that we wouldn't have to do extensive, expensive work on, we were kinda stuck. If I had a nineteen-foot hovercraft I'd be tempted to park it in the driveway and see if anyone complained, given that it allows vehicles of less than 20 feet to park there. Um. Does, "you must address us as 'Boardmember NAME' or you'll be fined," count? My niece when she was a toddler had a toy car that you can get inside & drive around using your feet. It was sitting in the back yard for a good 6 months when we were given a compliance notice about it being unauthorized on the property and must be removed. I was using my dads truck for a side job once a week, and one week it was cancelled. It was sitting in our driveway 'too long' and had a police officer knock on the door telling me I have to move it. Each house has a small tree planted out front (was a new neighborhood). Ours was broken into two due to strong winds one day which the HOA replaced for free. It proceeded to snap in half THREE MORE TIMES, but the HOA only covered the first one so we had to pay for it. Have a few others but HOAs are garbage, although it didn't help we were next door to the VP (which was a total d-ckhead). Why buy a house and have someone else tell you how to live in it? My friend put a pool in his backyard, and paid an extra $20,000 to make it 15 foot deep so he could have a high diving board . As as it was up the H O A said he couldn't have a diving board cuz he might be able to see into the neighbor's yard. my friend took pictures from his balcony and then took pictures from his high dive, he then took those pictures to the meeting and asked which one was from the high dive and which picture was from his hoa approved balcony. Both viewed into the neighbor's yard. He said if you don't pick the right one then I keep my high dive. They chose wrong and he got to keep his high dive. He won that small battle but he would constantly get fined for having his garage door open. Not my HOA but my mother's. She had a small Yoda statue on her front porch and a couple little gnomes in her garden and it was a pretty cute display that she got compliments on all the time. The HOA cited her because she didn't get approval first and it wasn't "holiday decoration". So she took down the gnomes, but she left Yoda and now dresses him up every single holiday just to be petty. Like... how the heck is that enforceable? Can't wash your car with too many bubbles. My dad's friend lived in a strata (same thing as an HOA) and had a guy come by saying that he was using too much of the wrong soap. He sprayed him with his hose and the guy never came back until his wife was home alone. Then he proceeded to harass the wife about having window boxes full of flowers to help the bees, and the wrong shade of white ("two shades off") for her curtains. He moved about half a year later. Christmas decorations are okay (lights, projections, inflatable Santas, etc. ), but don't try that for any other holiday! We put up a string of orange, red, and yellow lights outside of our window for Halloween two years ago and were told almost immediately to take them down or get fined. For like a foot and a half of lights that weren't shining in anyone else's windows. Front yard flower pots had to be ceramic, and large. I quite accidentally discovered that toilets fit ALL requirements as written, so acquired four such flower pots. That got them good and angry with me until the day we left. In order to sell or rent in my HOA, you must provide HOA docs to the new owner or tenant. They must be bought from the HOA, otherwise the sale / rental is not legal. $200 for a three-ring binder with 150 pages of poorly photocopied documents. The first page: These documents have not been updated since July 2002. Please see the HOA website for updated documents. Whats the most ridiculous "rule" you've been cited by a homeowners association for violating?